I’m very hesitant to write about anything super-personal on the internet. Well, false. I actually share my neuroses and anxieties with y’all all the time, internet, and I wax poetic about my quirks and problems and shortcomings, but I am hesitant to write about anything personal that involves someone else, because then I’m that girl. I’m that girl, airing my relationships for everyone to see, whether the intended party signed up for their name to be strewn across a webpage or not. I mean, I tried this time. You see, there’s this little buzz in the back of my head that’s been itching to write about this for a while. Nothing overwhelming, not even the beginning of the whole story, but still something. So, here goes. The Chicago airport is not where I expected anything significant to happen. The Chicago airport was supposed to be a stop that didn’t matter, literally, a go-between and maybe a few minutes of me reading an InStyle with an overpriced latte while instagramming a photo of my shoes out of boredom. We met at a baggage claim, which I think describes us maybe better than anything else could. A place that was full of people, full of distraction, and full of constant change. You’re not supposed to spend a long time at a baggage claim, you know. Just grab your bags and move on. By all intents and purposes, we shouldn’t have met. We should have just kept walking across the terminal to our respective locations. I mean, I know we were headed to the same place and probably would have run into each other anyway, but there’s something about suitcase carrier 5 that seemed to change things. So, we met amidst so many ridiculous things. I can, of course, remember my outfit and remember my hair color and style at the time, but I don’t remember the first thing you said– only that it made me laugh, and that you continued to make me laugh and distract me from important things. So everything else – people, appointments, cups of coffee – got half of my attention that weekend and even though that might usually cause me anxiety, I thought nothing of it. I’m always all-talk, but you could keep up and you could play along with all my puns and singalongs. We compared things in common and made far too many of the same references and got mad when we agreed too much. Because, let’s face it, the whole thing was somewhat sickeningly adorable, and you and I were much too cool for that sort of thing. We were both chasing after being independent and renegades and maybe one of us was wearing a ridiculous graphic t-shirt that said “Free Spirit” and taking it a little too close to heart, but still. We were not the sort of people to read Nora Ephron books and believe them, to let romantic comedy plot lines become reality or to take stock in a one-time meeting. We were supposed to be moving on. Getting on the next plane. Taking our suitcases with us, not opening them and unpacking our lives and talking about important things and agreeing so much. So, we met in a baggage claim, and I still don’t know what to do about it all. And now, a couple months and a couple thousand miles later, when you look at me and sing, “we found love in a baggage claim” to the tune of Rihanna’s “We Found Love (In A Hopeless Place)” like you always do, I’ll still roll my eyes, but hey, maybe one day I’ll end up writing it all down and it’ll seem less crazy and less cryptic. I’ve been fed up with this blog for a while. White girl problem as it may be, hear me out. Or don’t. I mean, there’s plenty of internet to scour that is less lion-y than this little domain. I’ve been tired of this blog being the same, feeling like I’m a never-ending ramble of the same topics. I get all sorts of blog-envy over other websites I gawk at daily–ones filled with pretty well-lit pictures and layouts, crafts and recipes, ‘outfit of the day’ posts and all those cute things that the blogging community tends to be drawn to. Meanwhile I’m over here slapping sarcasm around, making musical references, mentioning Ryan Gosling too much, and relying on inspiration that waxes and wanes based on my caffeine level for the day. Will I ever be the next Martha Stewart mixed with Paula Deen mixed with Annie Lebowitz of the internet? Probably not, but that’s not to say that I don’t want to incorporate different things and styles and some sort of photography around these parts. And I hope you’ll be with me, internet, at least somewhat, as I try to document important things and continue to ramble like I’m known to do. So, there’s that. Yes, I want to change things around my little website, but this thread of ‘new-ness’ goes a little deeper than that as well. As much as I can be stubborn with change, I tend to welcome the kind I like. I am enchanted and constantly wanting new colors, new textures, new sounds and new faces in my life. Sure, I am comfortable with the things I love and cherish them dearly, but I have an itch to explore and to discover and to consume all sorts of brand new material. I wasn’t always this way, though. Even though it takes a brave and confident individual to wear matching ruffled socks, she was actually a very scared kid and afraid of new things. She feared new school years, she feared things she didn’t know, and she even feared a lot of the rides at DisneyWorld. She was well-acquainted with crippling irrational feelings of being scared for no good reason. It took her a while to get adjusted to new things, but she found that if she could hold tightly onto the hand of Mom and Dad and Brother and Grandparents and various friends, it was not so bad. Tears were not uncommon, panic attacks and anxiety came in waves, but she was still surrounded by a group of people that wanted her to succeed and wanted her to find out all sorts of great things about this great earth, and so slowly embrace change, she did. And you see, once she did, each progressive time became easier. That little girl was me (spoiler alert!). Nowadays, the tenacity and cheerfulness and energy with which I tend to greet new days and new situations and new people has been well-earned and well-fought through years of anxiety for, and even though the uncertainty of change still creeps in from time to time, I’ve learned how to embrace it a lot easier. And so, as my Mama puts it, the little girl she’d never thought would ever leave home now wants to pack it all up in a suitcase and go see the world. So, in the season of embracing change I decided it was time to change to color of my hair…and my address. Do I know what exactly I’m doing yet there? No. Do I know the city like the back of my hand? I’m getting there. Do I have a place to live? Surprisingly, yes! And it has indoor plumbing! I love music, I love Nashville, and if there was ever a time to do something crazy like move to Music City and chase a crazy dream, now is that time. I’ve got little to no obligations, no pets, no husband and kids, nothing holding me here, and a family that’s been so encouraging about the whole thing. So much so, in fact, that my parents told me that if I don’t do it now, don’t take this chance while I’m young, I’ll always wonder, always regret it. I’m not saying my anxiety won’t come back like it tends to, but there’s excitement in this decision, too. So here’s to change, here’s to wearing hair turbans, and trying not to feel dumb taking self portraits for your blog in your backyard. Here’s to trying to cram 8 pairs of boots into one suitcase and realizing you have a problem. Here’s to long highways, supportive parents, reuniting with old friends, lots of live music, being young, and making new progress and new mistakes in a new zipcode. And if you ever find yourself in Nashville, internet, I’ll buy you some iced coffee and vinyl and we can try to figure out a life plan together. Lion’s honor. I steal things. I regret to tell you this, internet, because I love to be wrapped up in nothing but original creativity, but some of my little great ideas are recycled. Some of my perceived coolness (if not most) comes from me loving and capitalizing on the greatness of Julia Nunes- Youtube-sensation, ukulele lady and wonderful-sounding musician. 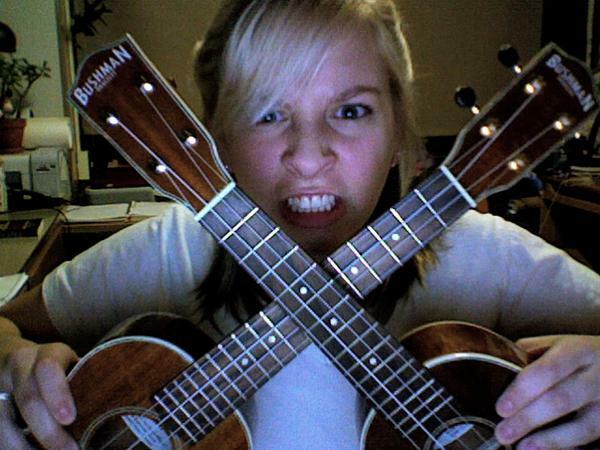 She’s one of the very big reasons that the ukulele became to so appealing to me. Well, that, and long-story-short, I had gotten myself into a little period of intense loneliness living alone my freshman year and buying the most adorable instrument saved me from going crazy in my room and allowed me to start writing my own songs, which in turn saved me thousands of dollars in therapy. Not kidding. But, back to Julia. Her videos are popular, if you’re a youtube music junkie (which I admittedly am) and if you look hard enough, you might just find other videos on the internet of a certain lion-haired girl harmonizing over herself and recording in the same possible way. Coincidence? Hardly. Right? And those are originals. Don’t even get me started on her cover songs. Amazing. Could I obsess any more? It’s possible, but I’ll save that for some other time. Heck, one of my dearest friendships started because he and I shared a crazy love for Julia and her music! And music bringing people together is what the whole crazy thing is about anyway, right? In all honesty, go buy Settle Down here or here or listen to it for free. Also, look for it and request it at your local music shop (Do people besides me do that? We should all start doing that!). Or just start watching any of her great videos on Youtube and fall in love. *And to any college freshman girls out there, if you are lonely and confused and emotional because college is just one big time for all those feelings, please forgo eating out for a week or consolidate your laundry money and buy a ukulele instead. My first and still-favorite uke was $50 with a coupon, you can get it here, and it’ll be so much better in the long run. I’ll even teach you if you want! When you learn two little chords in five minutes, because, yes, it is that easy, allow yourself to feel like a rockstar, and then keep on learning from there. Play as often as you can, but know that once you start becoming known as “that girl with the ukulele”, you’ll probably be compared to Julia Nunes pretty frequently. Don’t worry, though, because in actuality, being compared to her puts you in great company, and it is a super-huge-wonderful compliment anyway. In such a celebrity culture, I think my generation for the most part feels so much pressure to make every single minute of our lives EPIC. We want to upload fabulous instagrams to twitter and write captivating instantly-liked status updates and make everyone want in our crazy shiny well-lit photographed lives! But sometimes that’s just not reality. Is it sad to live in fear that my life is not as ‘insaaaaane’ as everyone else’s on my Facebook newsfeed?! The biggest exciting point in my life today was getting a mustard-yellow scarf that was originally $25 on sale for $9. And it is a huge scarf! A big huge mustard-yellow fashion-forward scarf! AND I THINK I HAVE EVERY RIGHT TO BE EXCITED ABOUT THIS SCARF! This scarf represents so much more than a article of clothing scored for little cash. This scarf really did make my day wonderful. Seeing it on the rack, I pictured it making all my outfits full of sunshine. I got to throw it across my shoulders dramatically like an old movie star when trying it on. My roommate bought a matching one in red so that we look like mustard & ketchup! And you know what? I will proudly wear this scarf and document its existence and not feel bad about the fact that it dominated my afternoon. I’m all about celebrating the simple things. If my life isn’t always one big outlandish party, that’s alright! Some days may seem more exciting than others, but today, let it be known that mustard yellow trumps everything else. P.S. Guys, Ryan Gosling was in Austin, Texas this weekend. I live near Austin. I work in Austin. Obsessing over a celebrity is juvenile and spilling details over the internet is tacky, though, so in order to paint myself in the best light, all I will say is: he is beautiful (really). P.P.S. Also, in 10 years when Terrance Malick finally releases the “upcoming project” that RGos was filming, I will be looking for my name in the credits…even if my credit is “Girl staring at RGos“.